Polar Bear Symbolism. . . Through the mists of blowing snow, something moves... barely visible, it is the emperor of the North, it is the legendary and massive Polar Bear. When you enter the Northern most territory, you enter the land of the Polar Bear, the land of freezing gales, ice castles and glaciers thousands of years old. With his camouflage of white, he symbolizes surrender... understanding the need of adaptation and the will to survive in the harshest of lands, he accepts his surroundings... he belongs here. Endurance, strength, acceptance and surrender are all totem powers of the Polar Bear. The spiritual meaning of the Polar Bear revolves surrender and acceptance. The white coat of the polar bear conveys the meaning that it belongs in the northern realms of snow and ice, and also reminds us to surrender to where we are in our life. Polar Bear not only belongs to the snowy domain, but makes itself quite at home in it. The polar bear migrated north a long time ago, and began the inner journey to change to adapt to its environment. The white coat of the Polar Bear also means surrender, like a white flag. He surrendered long ago to the transformation process that was inevitable, and so with time became the master of the winter lands. Because of his color, he can blend in to the snow, with the cloak of invisibility he is free to roam hunting for his meal. His only drawback is his black nose, which he has learned to cover up with his paw when he is within close range of his prey, so as to not give away his position. Polar Bears paws are enormous, and he has tremendous power in his arms. His legs are quite long and allow him to get a better view of his surroundings, as he stands 10 feet tall. Because of his longer legs he can run and swim very effectively. This polar bear symbolism trait indicates that he reaches out to find what he is looking for, and has a strong will to attain it. His shape is unique among bears. Although one of the largest of bears, second only to the Kodiak bear, he is streamlined so that he can swim more effectively from ice shelf, to ice shelf. This symbolizes that he is efficient in his thinking. The physical form and characteristics of the Polar Bear symbolize many things about his spiritual nature. Even the way they care for their young in the harshest of climates is a testimony to the love this creature has for its own. Polar Bear Spirit Animal ~ Symbol of Perseverance and Gratitude. . .
Polar Bear spirit animal embodies the symbols of perseverance and gratitude. The Polar Bear endures one of the harshest climates in the world, second only to Antarctica. Because of her tenacity, she has learned to persevere regardless of the opposition of the cold. This realm of northern winter is also unforgiving in foraging for food and shelter, but the polar bear does not complain. She knows that to succeed, she must keep her focus on what must be done. Because the polar bear has endured such hardship, she has learned to be grateful for small things. Another aspect of Polar Bear symbolism is gratitude. The Polar Bear is unmatched among predators,especially when she has cubs to feed. She is grateful for any meal that she can find, and enjoys shelter from the storm because of her harsh surroundings. Polar Bear Offers Insights of Determination. . . Very few animals on Earth have the determination of the Polar Bear. When the female has cubs, she will brave any danger to feed them. Sometimes she loses a cub to hunger or predators such as wolves or eagles, but that doesn't stop her willful focus on providing for her little family. Her family of cubs is just as important to her as human love is for their children. It is a misconception that animals, such as the polar bear, do not feel love for their own. Polar bears feel so much for their own, they are always watching them, protecting them, and providing for them. They are determined to care for their own by any means necessary. Polar bear symbolism is of a deep protective nature. Symbolism of The Polar Bear ~ Ice and Snow. . .
Additional Polar bear symbolism can be found in its natural surroundings of snow, cold and ice. The snow is a symbol of purity, and fresh new beginnings. In the purity of the snow there is a thought of all that is sublime and inspiring. The snow drifts with the wind, and surrenders to the power of the air. The bear knows these things and has surrendered to the elements. In the cold, there is the absence of heat. Heat represents aggression. The polar bear is not aggressive, he simply does what comes natural to preserve himself. He chose the snowy climate to be alone and solitary, apart from other creatures because he does not prefer aggression, but will display it in full form when need be. In the ice, we see clarity. Polar Bear symbolism is crystal clear, like the ice that surrounds him. His self assurance and acceptance comes from his clarity. 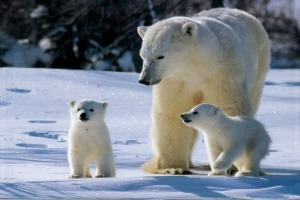 The Polar Bear is a Mystical Totem Animal and a Symbol of Peace and Tranquility. . . Even though the Polar Bear lives in one of the harshest climates on Earth, he has developed a sense of serenity in the midst of it. In adversity he has found peace. In the rigors of a full blizzard he has found tranquility. Through hundreds of years of struggle in the cold wastelands, he has learned the acceptance that few others in the animal or human species have found. As a symbol of peace, the polar bear teaches us that you can be at peace with your life, and be at one with nature and your circumstances. In adversity the polar bear has learned that in order to survive, it must attain tranquility of spirit, and has done so for thousands of years. The Polar Bear and the Magic of Acceptance. . . Acceptance is a very powerful form of magic. It gives us the power to see things as they are, and imbues us with the ability to see things clearly. The Polar Bear has accepted his surroundings and way of life through thousands of years of struggle. He became successful in the rigors of the cold by this one fact. 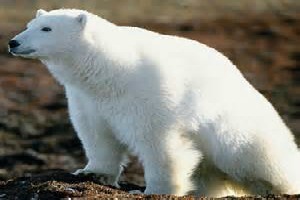 The Polar Bear accepts that it must hunt in meager circumstances to sustain its life and the life of its family. Through eons of struggle he came to realize that to survive in his world he had to surrender to the elements, and flow with them, instead of fighting them. This is the lesson of the Polar Bear totem animal. That I May Be Free!